Peak District: Mam Tor and Blue John Cavern – Tasting the World – On the road, with stuffed hand luggage and face. Camera in my hand. Two weeks ago we had a visit from Hungary and we wanted to show him some nice places around. On Saturday we did a short walk up to Mam Tor in Peak District. And because it was really short, we were thinking what to do next. We remembered that we saw a sign for some cavern while we were arriving to the parking place, so we went to check it out. It was called Blue John Cavern and it was located straight down the hill from Mam Tor. The entrance fee was quite expensive (10 GBP), but the guide was funny and told us interesting information. The cave complex is named after the rare fluorite that has been mined there (mining continues even nowadays). There are more interesting things to see in the cavern besides the stone mining. There are some stalactites and stalagmites, but they are not exceptional. You can also see a collection of 4.000 years old bones that were found in the cavern. There are human, dog, and deer bones as well as bones from animals that are already extinct. 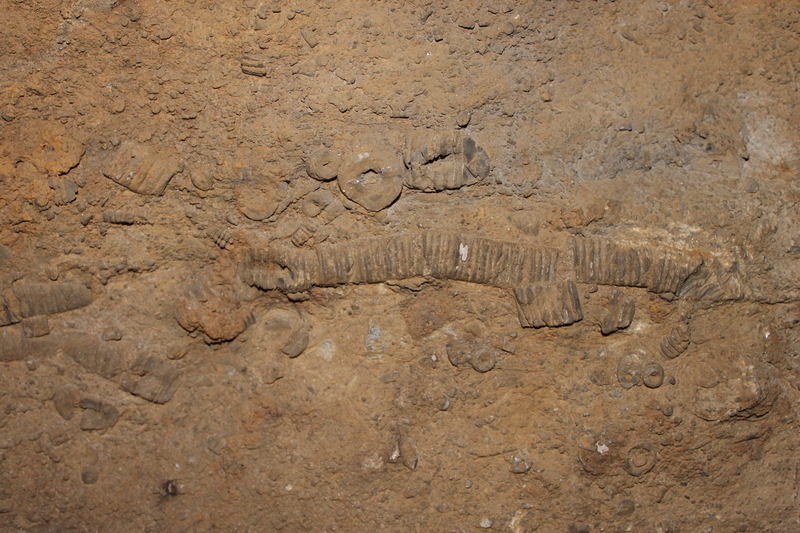 What I liked most was that the limestone contains fossils of small animals and plants deposited on the sea bed millions of years ago. So this is probably the main reason why I recommend visiting this place – it´s not very often you san see and touch 330.000.000 years old creatures!